Since 2001 HEARSE has spread their Death´n´Roll over the world. Johan Liva formed the band after he left ARCH ENEMY. The others in the band are guitarist Matthias Ljung and drummer Max “High Chaparrall” Thornell. Johan and Max were previously with FURBOWL, and to further their chances they hired Dan Swanö to produce their effort. The intro is among the lightest I´ve heard from this band. It transgresses into “Misanthropic Charades”. Spontaneously it feels more melodic than ever, the melodic patterns are all over the sound but Johan´s vocals are undoubtedly his trademark. The good trend continues in “Sundown”, the guitar work is well-deservedly at the front of the mix and the overall sound is clear and fat. 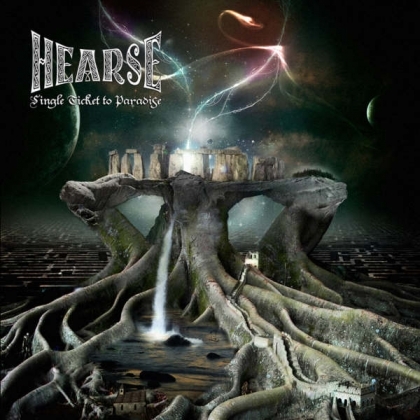 The earlier HEARSE albums missed the melodic profile that is present here, but there were a number of heavy and melodic exceptions on each disc. The first track I do not like is the spoken vocals “An Emotional Fraud”, but it is only a temporary feature. The song has an elder touch than the other tracks structure-wise. On the other hand, talk and radio voices work well in the title track, odd. Odd is also the bossa nova part in “The Ferocious Embrace”, but it sort of makes the track varied and entertaining. As a whole this album feels both deeper and more brooding at the same time as the melodies have been given more time and work. The blistering guitar parts have also been given more space. This album is almost exactly what I hoped for when the promo pack arrived!